Hawaiʻi Island police are renewing their request for the public’s help in locating a 19-year-old Hilo woman wanted on an outstanding bench warrant. 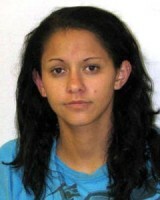 Cristinalynn Kainani Wakita is wanted for contempt of court. She is also wanted for questioning in other investigations. She is described as 5-foot-4, 117 pounds with brown eyes and brown hair. Police ask anyone with information on her whereabouts to call the Police Department’s non-emergency line at 935-3311 or Officer Donovan Kohara at 961-2272 or donovan.kohara@hawaiicounty.go….